Making the Dean’s List is every college student’s ambition. For those of us who have a few years between college and the workforce, we still remember with pride the kudos that came with making the Dean’s List. Now, however, everyone can be on The DEAN’s List. Meet Porter Palmer, creator of the DENs newest blog on the Discovery block: The DEAN’s List. She signs her posts “Your Friendly Assessment Nerd,” (I’d read and love her just for that alone), but she is anything but (she taught me how to create what she calls that signature MySpace look). 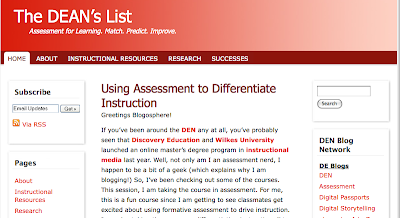 Her blog addresses a critical issue that everyone in education faces daily, from teacher’s assistants through superintendents and school board: ASSESSMENT for differentiated instruction. Palmer’s blog addresses an expansive array of topics, from research, instructional resources, and measuring successes, to using Predictive Benchmark (a great new Discovery resource for individual student assessment for differentiation), building a PLN, monthly assessment webinars, the impact of international tests on US education, as well as conducting on-line chats about English-Language Learners. She’ll keep you up-to-date on people, topics, and trends in the world of assessment, and she’s only just begun. RJ, I’ll be sure to let you know about upcoming webinars. We’re planning to do a professional development series on assessment in the near future. I’ll be sure you know! Thanks for the great post.